With many consumers owning laptops or tablets as their sole computers nowadays, the concept of installing a sound card -- let alone any add-on card -- can be totally foreign. Believe it or not, however, many people still use and love desktop computers -- including yours truly. Not only can a tower be more powerful than their mobile counterparts, but they can be much easier to upgrade too. 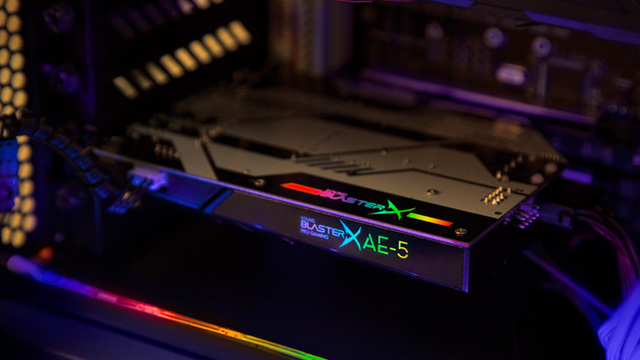 Even if you do own a desktop computer, a high-end sound card, such as the Creative Sound BlasterX AE-5 which I have been testing, may not be in your best interest. This card is designed for computer enthusiasts that are audiophiles, gamers, or both with decent headphones or speakers; there is no point in buying a high-end sound card to use with $10 Walmart speakers, right? The big question is, should you purchase the card? When you take the Creative Sound BlasterX AE-5 out of the packaging, you immediately notice the high quality. This is a sound card that the company clearly cares for. In other words, while the specs are top-notch, the overall design is exceptional -- it was built with purpose. Before we get to the sound quality -- the most important aspect of a high-end sound card -- I want to focus on a stranger aspect -- the RGB lighting. The card itself doesn't just offer customizable lighting on itself, but it includes a full-fledged RGB controller which can control attached LED strips. The card comes with one such strip, but you can buy more and daisy-chain them. Whether or not you need more than one strip will depend on your chassis and personal preference. My case has sort of a small window, and I am satisfied with the results of a single strip. Of course, my motherboard and graphics card feature RGB lighting too. The customization options for the RGB lighting is almost overwhelming, and that is a good thing. There are probably millions of potential options when you factor in the numerous colors and behaviors. In other words, you can fine-tune the settings to meet your exact preferences. But OK, this is a sound card, right? Let's get to sound. For most people, their onboard motherboard audio will be good enough. You know what? If you are happy with "good enough," more power to you. If you are passionate about music and audio in games, however, I am happy to say that the Creative Sound BlasterX AE-5 is an amazing product. Music is one of my biggest hobbies, so that is what I tested first. I don't have a fancy 7.1 speaker setup, as that doesn't help with most music anyway. Instead, I tested with my Audio-Technica ATH-M50 headphones and Logitech 2.1 Z337 computer speakers. Neither of these products are expensive, but they are known for providing exceptional audio quality without breaking the bank -- I like value. The test machine has an AMD Ryzen 7 1700, 16GB RAM, and it is running Windows 10. The onboard audio used for comparison is a GA-AX370-Gaming 5 motherboard using Realtek ALC1220. This is actually one of the better implementations of motherboard audio, and to be honest, it has not disappointed me. I tested the card exclusively using the latest version of Microsoft's desktop operating system so I could get the full experience. It is possible the card could work under Linux for audio only, but I did not test it. Keep in mind, even if it does work under Linux, the software won't -- you won't be able to control the lighting or audio effects. With all Creative software trickery turned off (more on that shortly), and with both headphones and 2.1 speakers, music sounded more vibrant and punchy compared to my motherboard's audio. I didn't expect to hear a dramatic difference, but I really did. This was with multiple music genres, such as rap, rock, and electronic. Out of fear that it was placebo, I had a family member switch between both -- without me looking -- and I correctly identified the Creative Sound BlasterX AE-5 every time. While this may be sacrilege to some, the Creative Sound BlasterX AE-5 really impressed with the "Crystalizer" trickery turned on. If you aren't familiar, this is proprietary Creative software that attempts to make compressed music sound uncompressed. I have respected this solution for well over a decade now, and I am happy to say it does make music sound better to the listener. Audiophiles will surely pooh-pooh Crystalizer, but I don't care -- it makes music sound better to me. Since it is optional, you can opt to just turn it off if you prefer. Not all of the software options are good, however. The virtual surround sound is terrible, and should be avoided at all costs. Again, this is optional, so it is nothing to really worry about it. Since this sound card is being marketed to gamers, I tested it with PC games too. Here, the audio sounded better as well, but I didn't bother with the gimmicky features like Scout 2.0 which supposedly makes it easier to hear enemies from further distances. Quite frankly, I don't like such a feature as it is arguably cheating. Not to mention, I wasn't happy with the results when testing it years ago. This remained off. 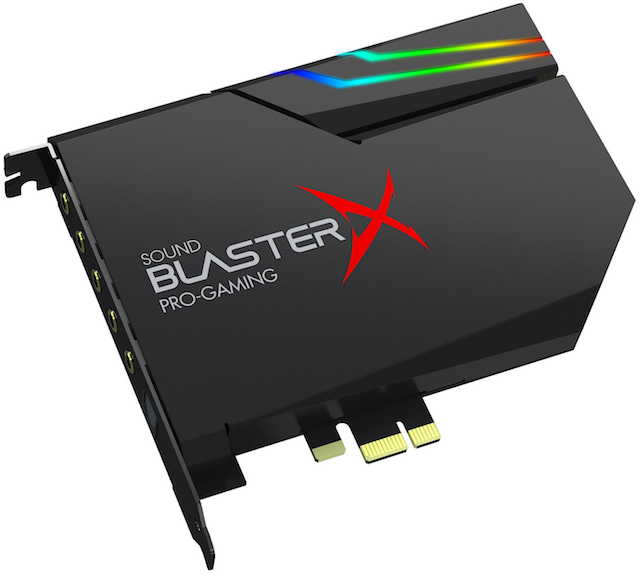 My only big complaint regarding the Creative Sound BlasterX AE-5 is the use of an old-school molex connector for power. Believe it for not, my PC doesn't even have such a connector anymore -- I only have SATA-type power connectors. This meant I had two buy an ugly adapter, which turns SATA into molex. It was inexpensive from Amazon but an added cost nonetheless. I would like to see Creative include such an adapter in the box, or better yet, equip the card with a SATA power connector. So here's the deal folks. Reviewing a sound card is tricky, as sound quality is a very polarizing topic -- what my ears find pleasing, your ears may not. Even though I find the audio quality to be a worthy upgrade over my motherboard, you will need to hear it for yourself to make that determination. If your PC already has everything you want -- a great SSD, RAM, CPU, etc. -- and you desire exceptional audio quality, the Creative Sound BlasterX AE-5 is $150 well spent. You should notice a difference between this card and your motherbord's audio -- with or without the Crystalizer feature enabled. The best part is, it should last you many years, moving from PC to PC, as you upgrade or build a new machine. The RGB lighting is just icing on the cake, as it adds a layer of fun to your gaming PC. The amount of lighting customization is jaw-dropping, and you could easily spend an afternoon playing with the different colors and behaviors. Should you buy it? Yes -- as long as all of your other components are already respectable. In other words, I would not buy a sound card if you are still booting your PC from a HDD -- spend $150 on an SSD first. Only have 8GB of RAM? Upgrade to 16GB first. 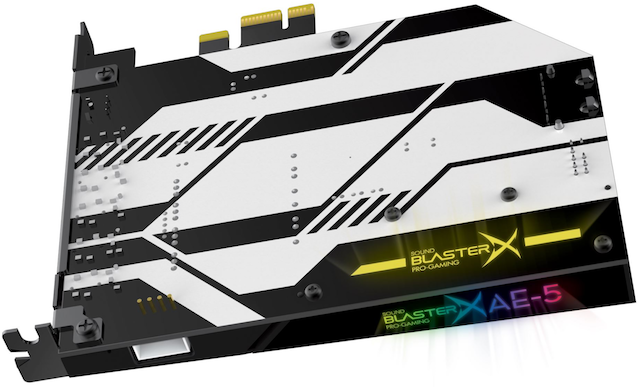 Once your PC is in good shape, you should absolutely buy the Creative Sound BlasterX AE-5 32-bit 384 KHz PCIe gaming sound card -- your ears will thank you.